During the past 50 years, fisheries around the world have increased from 19.3 million tons to more than 154 million tons per year. This dramatic increase in fishing pressure presents a problem not only for the target species but also has indirect effects on the incidental capture of nontarget species, also called “bycatch”. Modern fishing gear can be very unselective, catching and discarding large quantities of bycatch. Incidental catches represent a serious threat to endangered species (Figure 1), cause severe changes in the ecosystem function and also have critical social and economic impacts such as loss in job opportunities which can mean hunger in developing countries where few other options exist. Despite the general recognition of the issue and efforts to reduce incidental catches, this is still a major and complex problem. Lewison et al. (2014) investigated the global distribution and intensity of incidental catches of air-breathing megafauna (sea turtles, marine mammals and seabirds) across the three most used types of fishing gear (trawl, gillnet and longline). They asked input from 17 scientists of which 5 are experts on seabirds, 6 on marine mammals and 6 on sea turtles. Each scientist was given three datasheets (one for each type of gear) for the groups of animals they had expertise. The authors used data published between 1990 and 2008 in peer-reviewed publications, agency and technical reports, and symposia proceedings to describe the global patterns of bycatch and gaps in data availability. Results indicate that sea turtles had the highest bycatch intensity (statistically significant) followed by marine mammals and seabirds. 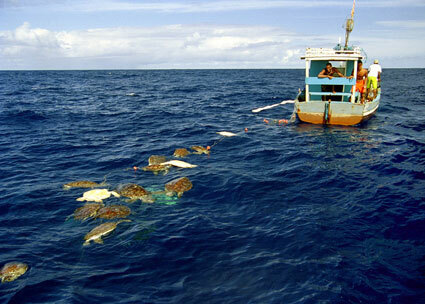 Sea turtle bycatch was most frequent in the southwest Atlantic, eastern Pacific and Mediterranean oceans. This reflects the success of the implementation of turtle excluder devices in Australian trawl fisheries, where incidental catches of sea turtles have been reduced by 90%. Regions with highest bycatch of marine mammals were the eastern Pacific and the Mediterranean and seabirds bycatch was highest in the southwest Atlantic and Southern Indian oceans. Among the different types of gears for bycatch intensity, gillnets were the most scored followed by longlines and trawls. Figure 2: Cumulative bycatch intensity for the three groups of animals and gear types across the globe. Numbers represent the number of data records. In terms of the cumulative bycatch intensity, the Mediterranean and the Southwest Atlantic were the regions with the highest score (Figure 2). However, there is no data available for some regions such as the Indian Ocean, eastern Atlantic, southeast Asia, and central and western Pacific. It is likely that other bycatch hotspots exist but are not documented in this study. Additionally, the spatial patterns observed might also be influenced by the distributions of the species, the fishing effort and mitigation efforts that have been reducing bycatch in some regions. This study is the most complete description of the global distribution of bycatch to date and it highlights the complex nature of the problem. Because many species travel long distances and have the potential to encounter various types of fishing gears, there is a need for a multinational coordination and integrated approach to report and reduce unintended catches more effectively.